The Financial Times reports on the World Health Organisation’s strategy for undermining e-cigarettes and diminishing the potential for tobacco harm reduction [WHO plans to regulate e-cigarettes in the same way as normal tobacco (£)]. I have now obtained a copy of the leaked document the FT refers to. This document is the WHO FCTC Bureau minutes from November 2013 and it reveals a great deal about this remote and unaccountable organisation. It shows how it is planning to use the WHO Framework Convention on Tobacco Control to apply the same sort of restrictions to non-combustible nicotine products like e-cigarettes that are applied to the far more dangerous smoking products. This is a continuation of an attitude that WHO displayed at the last Conference of the Parties (COP-5) in 2012: see my Open letter to COP-5 delegates, which includes links to WHO’s papers on what they call Electronic Nicotine Deliver Systems (ENDS) and smokeless tobacco (SLT). That open letter to delegates also attracted many comments from tobacco and nicotine experts expressing concern about WHO’s negative approach. So far, WHO appears to have had no change of heart. Update 22 April. An excoriating FT leader followed a week later: Follow the science on e-cigarettes. WHO itself projects one billion avoidable deaths from smoking in the 21st Century. If WHO manages to engineer the FCTC into over-regulation of safer alternatives to smoking, it will be denying potentially hundreds of millions of smokers an opportunity to avoid cancer, cardiovascular and respiratory disease. We will have the bizarre situation of WHO emerging as one of the most serious causes of preventable death in the 21st Century – it would be preventing the prevention of preventable deaths – the exact opposite of what it is supposed to do. Not only that, it would disempower millions of ordinary people, as Gerry Stimson highlights in conflict with WHO’s own Ottawa charter on public health. Health promotion is the process of enabling people to increase control over, and to improve, their health. This is exactly what ENDS and SLT do… they allow people to control the risk associated with taking nicotine and reduce it down to very low or negligible levels. The fact that authorities like WHO think it would be better if they quit nicotine use completely is of little consequence. It is up to people using nicotine to decide, and a decision to switch to SLT or ENDS has two beneficial effects: a dramatic reduction in risk, and a staging post for complete nicotine cessation, if the user wishes to take that step. If they conclude they want to keep the nicotine without the harm, we – the coffee and wine drinkers – should not sit in judgement of the use of a different recreational drug. Notice that these minutes are leaked, and not simply routinely published as we now expect from 21st Century transparent government. There is no reason to keep them secret and every reason to publish them – other than how embarrassing they are to the participants. But then one gets an idea of this institution’s interest in openness in Agenda item 8: para 57-60, where they discuss screening and excluding members of the public who are associated with the tobacco industry – note this isn’t about granting ‘observer status’ (the right to sit in the negotiating room and occasionally make statements when invited by the chair), it is about the right to sit in the public gallery, when the public gallery is open. Then they discuss holding closed sessions: why? This is not a place where anything needs to be secret – no operational security details are discussed – and the sunlight of public scrutiny is always valuable. The idea that WHO chooses which stakeholders are granted access to a process that may significantly affect them is reinforced at para 34-36, where they (correctly) note tobacco growers have a legitimate interest in Article 17 and 18 of the FCTC (economic diversification and environment), but then decide to shut the ITGA (International Tobacco Growers Association) out of the proceedings all the same. One wonders about the integrity of a process that is so fragile that it cannot tolerate dissenting voices. 23. The Head of the Secretariat [Dr Haik Nikogosian] felt that more importance should be given to the threat posed by electronic cigarettes and other smokeless products, which in his view could result in a new wave of the tobacco epidemic. This item should in his view be given a special attention at COP6. How these products will create ‘a new wave of the tobacco epidemic‘ is not explained, and there is no evidence anywhere in the world to support that contention that they will. Nor is the characterisation of ENDS or SLT as a ‘threat’ appropriate. The huge opportunity to reduce the billion deaths that WHO estimates from smoking in the 21st Century is not even mentioned. Like so many public health organisations, WHO lacks a coherent intellectual framework for discussing and negotiating the ‘risk politics’ of harm reduction. 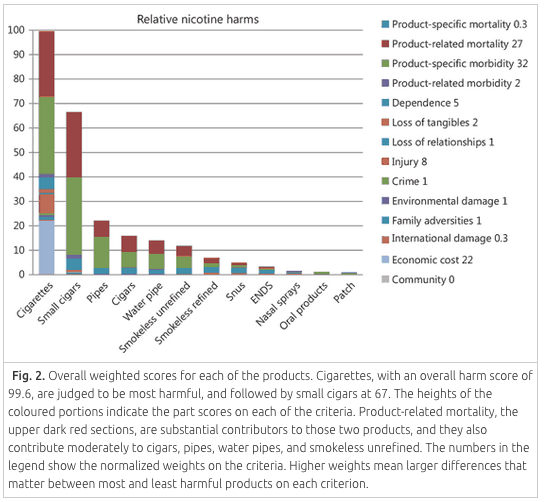 In the risk politics of harm reduction, the appropriate comparator is smoking; the primary concern is reducing disease and premature death; and the regulatory balancing act is to mitigate minor (or implausible) risks of unintended consequences without squandering potentially huge opportunities to reduce smoking related disease through excessive restrictions and red tape. Unless and until the WHO and FCTC can provide a more sophisticated framework for managing these products, it is not a suitable instrument for regulating them. According to its objective (Article 3), the FCTC exists to reduce the “devastating health, social, environmental and economic consequences of tobacco consumption“. ENDS and SLT do not produce devastating consequences. As a sign of how remote from the evidence the WHO and its leading international representatives are, turn to paragraph 13. 13. Ms Dorcas J. Kiptui (Kenya, Africa Region) raised a concern at the strong and aggressive interference of the tobacco industry in her Region, in particular with regard to the threat posed by the introduction of SLT products and ENDS and the claims made by the industry that these products were safer than cigarettes. It was important in her view that a decision be taken by COP6 on this matter to help countries regulate these products as soon as possible. So, what’s the plan for informing people about risk? It certainly would help if those involved in running the FCTC were more informed. Here is one analysis that might help from Nutt D.et al (2014), and it is broadly consistent with other estimates, it suggests that SLT and ENDS are one to two orders of magnitude (10-100x) less harmful than smoking. If we focus only on disease, then the risk reductions are greater still – probably 99% or more for ENDS and almost as much for snus. This picture should awaken WHO to huge possibilities, but they appear unaware or unconcerned and without an alternative analysis. This is all work in progress in the run up to COP-6 of the FCTC, which is to be held in Moscow from 13-18 October, nationalist aggression permitting. The plan for dealing with harm reduction approaches is set out in Agenda item 11, para 69-75. First commission a one-sided background paper focussed on minor concerns, and make that the big issue. The fact that these non-combustible substitute for the vastly more toxic combustible smoking products does not seem to be part of the thinking. 71. WHO/PND had prepared a draft background paper on ENDS to be submitted to COP6. […] The paper to COP 6 would address the scientific evidence on toxicity and addictiveness of ENDS and would hopefully contain policy options for the prevention and control of ENDS as requested by the COP. 72. The Bureau felt that it was important to include scientific evidence as to whether ENDS contained nicotine from tobacco leaves – and not synthetic nicotine as claimed by the tobacco industry – in which case they would be considered as tobacco products as per the WHO FCTC. The Bureau also referred to Articles 5, 8, 13, and 16 of the WHO FCTC that contained provisions to allow the COP to make recommendations on regulations of SLT products and ENDS. Art 5. Would define e-cig companies as tobacco companies and (and so exclude them from most policy deliberation and bestow official pariah status on them, which is completely unjustified). Art 5. Would require FCTC Parties to ‘prevent or reduce’ use of SLT/ENDS – this defines them as a problem to be reduced, rather than a solution to be advanced. See the discussion below on including e-cigarettes in a tobacco target. Art 8. Deals with second hand smoke – which would potentially include vapour (why mention it otherwise?) and so could apply the same situational restrictions to vaping as smoking by default. The is no basis to use the law at all to determine whether someone can use ENDS in a given place, let alone an international treaty. Unless there is material risk to others, it should be a matter for the owners or operators of public spaces. See more views on vaping in public places. Art 13. Deals with banning advertising, sponsorship and promotion – if applied fully, it would protect cigarettes from competition and inhibit development of a benign consumer nicotine industry. The bans on advertising in, for example the EU, are justified with reference to many thousands of deaths. No such justification exists for ENDS or SLT. In both cases, they are likely to reduce the death toll. There should be controls on advertising, but this should be proportionate and more like those applied to alcohol advertising in many countries. See more views on e-cigarette advertising. Art 16. Relates to sales to minors – almost all involved are content to have the product exclusively aimed at adults and no jurisdiction needs FCTC to do this. – include ecigs in targets for reducing tobacco (eg, the UN/WHO non- communicable disease target to reduce tobacco consumption by 30% by 2025. E-cigs should be used to *meet* this target, not be part of it. All of this would be highly counterproductive and damaging to health. It’s a kind of double negative: getting tough on e-cigarettes and harm reduction is just the same as protecting cigarettes and causing harm. Are e-cigarettes a tobacco product? Whatever the definitions, the main problem with defining them as tobacco is that they are automatically classed as part of the problem, although they are already emerging as an important part of the solution. Even the definition ‘contains tobacco’ is unsatisfactory if you take a forward looking view because it fails to differentiate between combustible and non-combustible tobacco. Non-combustible tobacco can have similar risk characteristic to e-cigs, and has minimal risk relative to smoking. Again it is part of the solution not part of the problem, as argued many times on this blog – how can they just ignore among the best tobacco and health results in the world in Sweden see: Why is the EU banning Europe’s most effective anti strategy? – in which several experts set out the evidence and experience of SLT in harm reduction, and so-called experts from WHO made fools of themselves. Source 72 and 73 are: WHO Indicator and Measurement Registry (2011). But these do not, at present, mention e-cigarettes. So WHO is anticipating the definition of e-cigarettes as a tobacco product later in the year, and in advance of any agreement on this from the Conference of the Parties. If agreed, this would be an extremely serious and negative development – defining ENDS and SLT as part of the problem rather than part of the solution, based on no evidence at all. See my response to the consultation (now closed) here. The WHO is in danger of becoming an agent in causing the very harms it is trying to prevent and obstructing people’s personal efforts to control their own risks. If the WHO wishes to meet the non-communicable diseases (NCD) target to reduce tobacco use by 30% by 2025 – a laudable but ambitious goal – it needs to include ENDS and SLT as part of the solution, not part of the problem. The target is there to reduce disease, and that is what matters to WHO’s broader mission. If ENDS are included in this reduction target, it will not be met – and will be missed by some distance. If ENDS are used to meet the target, there is a chance of success. The risks of ENDS and SLT are not just a little lower than smoking, they are 95-100% lower. So far we see little risk from e-cigarettes or modern smokeless tobacco products – at least risks that are comparable with everyday hazards, like consuming coffee. WHO does itself, global health and ordinary citizens no service by commissioning research from sources that will reflect its own biases. We will return to this. FCTC and COP6 – WHO? | What Does The Law Say? Labels – Part 1: What Laws & Regulations Don’t Apply? | What Does The Law Say? The FCTC is the first explicitly public health orientated treaty to be agreed under the UN system. It is also the first treaty to be negotiated under the auspices of the WHO, predominantly by health officials without the experience of multi-lateral treaty negotiation and its unique processes and terminology; and with a high degree of involvement by civil society supporters. Not surprisingly, given this groundbreaking context for a negotiation, many of the conventions and precedents regarding treaty formation simply didn’t apply. That’s how FCTC Article 5.3 was able to emerge – because no one, or not one of the 193 negotiating governments, stopped its passage. In multilateral-speak, consensus is the absence of a formal objection and the negotiating environment was far too political for anyone to object. I sat through all the FCTC negotiations at the INBs in Geneva as head of the BAT delegation to the WHO public gallery. As a former government official involved in multilateral negotiations my first observation was the extent to which it appeared amateur in so far as the negotiators were not following norms of treaty negotiation such as the diplomatic disciplines around bracketed text, the traditional use of ‘informal’ negotiating groups to enhance progress, or the way negotiating coalitions were structured. It was evident when considering the make up of delegations that most were comprised of health officials, scientists, and doctors; and while they may know a lot about tobacco and health they did not know much about the creation of policy or the creation of international law. There was an official on the US government FCTC negotiating delegation called Gregory Jacob who later wrote a report about the process in the Chicago Journal of International Law saying: ‘The object of a treaty negotiation is the making of law, and that is not something that public health ministers are necessarily particularly well equipped to do…the inexperience of so many of the delegates with the enterprise of treaty-making, coupled with the inexperience of the WHO itself, significantly exacerbated other problems inherent in the WHO negotiation structure…it was readily apparent almost from the outset that the negotiating process had become dysfunctional…’. One of the most significant results of having so many inexperienced delegates was that this gave NGOs accredited to the WHO room to be highly regarded providers of advice to government delegations – often in areas that went beyond their substantive expertise. NGOs undoubtedly should have a role in providing advice to governments but during the FCTC Geneva negotiations it was often difficult to tell them apart from government delegates. Jacob wrote: ‘…these tactics would not have been so disturbing if they had not had much of an effect, but the inexperience of many of the delegates rendered them ripe for capture by sophisticated NGOs.’ Unlike the tobacco industry, which did not really have its act together, had no advocacy positions until well in to the process, the NGOs were a credible global force and went out and lobbied for what they wanted. In the context of this process they were, and still are, expert in crafting public affairs strategies and their achievement on this issue is likely to be a textbook case in the future. Greg Jacob wrote: ‘The NGOs complained vociferously about a supposed tobacco industry lobbying campaign aimed at sinking the Convention, but other than a couple of representatives of the duty-free lobby, the tobacco industry was nowhere to be found. By contrast, the NGOs, worked the halls masterfully…”. As a result the final FCTC in article 4.7 gives a precedent setting role to civil society in implementing the FCTC as an institutional part of the process. Compare this eventuality with the energy industry, which was and still is at the heart of deliberations surrounding the Framework Convention on Climate Change. I recall that at the time the front cover of an edition of The Economist stated: ‘Cleaning up – a 15 page report on how business is tackling climate change’. Not only does the article outline what business is doing it outlines where governments need to help – which is in stark contrast with the tobacco industry’s relationship to the FCTC. Given the political dynamic of the negotiation and the defined anti-tobacco prism through which all of the FCTC treaty issues were viewed, it is not surprising that article 5.3 emerged and that more important policy issues such as the question of harm reduction was quickly put to one side. With unmitigated anti-tobacco sentiment being the central premise of the entire process, the incentive to delve into the subtleties of questions of relative harm was absent. And, with the tobacco industry successfully ring-fenced out of the proceedings there was no one to pursue the issue. The driving idealistic force behind the initiation of the FCTC, the whole structure of the negotiations, the principals involved in the delegations (both officials and NGOs) worked against any kind of intervention that might have challenged the ‘all tobacco is equally evil’ and ‘quit or die’ sentiment that pervaded the process. So we have now, and FCTC with article 5.3 and no harm reduction policy… not good. Clive, could you please explain the relationship between the WHO and national governments. Much of the funding of the WHO is by country donations. Surely we order the WHO about – not the other way round? Good question, I was wondering the same thing? Has Clive responded yet? It is a very good question! The first issue is formal versus informal accountability. WHO provides a secretariat function and it is the state parties to the FCTC (i.e national governments) that make the decisions, usually via consensus, at the Conference of the Parties or other working meetings. BUT that’s only half the story… WHO drafts the papers and frames the issues and options for the parties to debate and agree. So its role is a bit like the Commission in the EU. It sets the agenda. It is in the nature of international treaty diplomacy that most involved just want an agreement, and don’t care that much what it is in detail. They tend to approach these meetings with ‘red lines’. These are things they definitely don’t want, or things that their politicians have promised they must get from the negotiations. So most negotiation is based on ducking and weaving around red lines – heading towards an agreement. This tends towards incremental tinkering and finessing the original proposals of the secretariat. Of course it doesn’t always happen that way, but that’s the norm. It’s that’s exactly what happened in the EU Council (i.e. EU member state governments). In the ‘general approach’ of June 2013, they just fiddled with the initial Commission position. It took something disruptive, the European Parliament, a bit more directly influenced by ordinary voters, to dislodge them from Council position and they didn’t like it one bit. There is no real equivalent of the disruptive role of the directly elected representatives involved in this. In fact it is packed out with NGOs that are broadly hostile to harm reduction. Second issue is WHO’s own governance. WHO is a so-called International Non-Governmental Organisation. It has its own governance arrangements, which consist primarily of the World Health Assembly (all its 194 member governments) and its Executive Board of 34 member representative who hold the executive to account. This machinery is extremely remote from from citizens and not normally concerned with detailed stuff. They would instinctively see any approach to them as a vested interest and tend to back WHO – they don’t do much original thinking at that level. It might work if we knew one or two of them outside this role, but a cold approach would be ineffective. Thanks for your time Clive. I’ve learned more about international politics during the past year than in the previous fifty six. And do you like what you see? Wait… don’t answer that…. It is ironic that ECs were invented by Hon Lik, a Pharmacist who was devastated at his Fathers’ death from Lung Cancer in China. He was a 60 a day smoker who managed to quit using EC. In other words ECs were invited for smokers by smokers so they would have more control over their habit, and minimise the harm caused by nicotine addition. Many users see them as ‘two fingers up’ to Big Tobacco. Hon Lik probably would not have predicted in his wildest dreams that these products would be put in the same category as the products they were designed to counter. Organisations such as WHO seem to have the ‘wrong end of the stick’ to such an extent that I can only conclude that some people working within this Organisation must having a low intelligence / academic reasoning abilities! Personally, I know at least 4 people who’s lives have been saved by these devices. Also, with the best devices (high nicotine tanker systems that the EU wants to ban) I do not know a single person who uses them who has not been able to quit long-term. In all cases their health is much improved both subjectively and objectively (as assessed by their GPs). Hi Jon – I think the picture of a lawless mendacious industry that emerged from the documents released through litigation in the late 1990s early 2000s had a lot to do with it. My own masterpiece, jointly with Andy Rowell and Ross Hammond, Tobacco Explained, gives some idea of we thought of them around then. I was convinced then (and still am) that they were up to their necks in organised crime through ‘Duty Not Paid’ or ‘Transit’ trade as they controlled illicit sales of legally sold products as though it was any other distribution channel. Thanks Clive, a really interesting piece. It’s a bit like the tail is wagging the dog here: the FCTC’s goal of excluding the tobacco industry from any debate almost seems to dictate the attitude of WHO / Conference of Parties towards lower risk products and take greater precedence than potential public health benefits. I had another look at the ‘Guidelines for implementation of Article 5.3’ and a rather feeble document referenced in that (‘Tobacco industry and corporate social responsibility – an inherent contradiction’), but can you recommend any further reading on how this article was framed in the original framework convention and the how the subsequent guidelines were developed during FCTC discussions? Has there ever been any debate in FCTC meetings about circumstances in which the guidelines might need to be changed? 5.3. In setting and implementing their public health policies with respect to tobacco control, Parties shall act to protect these policies from commercial and other vested interests of the tobacco industry in accordance with national law. Principle 1: There is a fundamental and irreconcilable conflict between the tobacco industry’s interests and public health policy interests. I think that principle is confounded by the tobacco companies’ legitimate interests in non-combustible very low risk recreational nicotine products. If there is a market in recreational nicotine, it is good for public health that it is supplied with low risk nicotine products. Governments permit, regulate and tax the market in recreational nicotine, so if you think that is irresponsible then talk to the people who allow the market not the people who supply it. That ‘principle’ fails with harm reduction and is already a prodigiously falsified as applied to snus manufacturers. The trouble is that the tiresome trivial politics of this don’t even allow the public health establishment to get behind by lifting the ban on snus in the EU even though they just had the opportunity and all the necessary evidence to justify it. I can’t see them changing this guidance – being sworn enemies of Big Tobacco is such an easy win, that I can’t see anyone going in to bat to change these guidelines. So my advice is to ignore it: get on with developing and marketing low-risk alternatives to smoking, and see what happens when ‘facts on the ground’ leave these views looking hopelessly quaint and out of touch. Yes, I hadn’t forgotten how effective a job you did! I would largely agree with you on DNP / illicit too, although now that the threats seem to outweigh the opportunities they’ve (at least largely) changed their tune. They have only themselves to blame for the position in which they now find themselves with regard to public trust, so I completely understand the context in which the FCTC was drafted. As you say, the Guidelines seem to go well beyond Article 5.3 itself – a number of them (eg the recommendation to ban disclosure of CSR activities) would seem to be unenforceable at best. I see the guidelines were adopted in November 2008 – ie well after some of the first snus test marketings had begun – but will have a dig around to see if I can come up with any more context for how and why the guidelines themselves were so drafted. 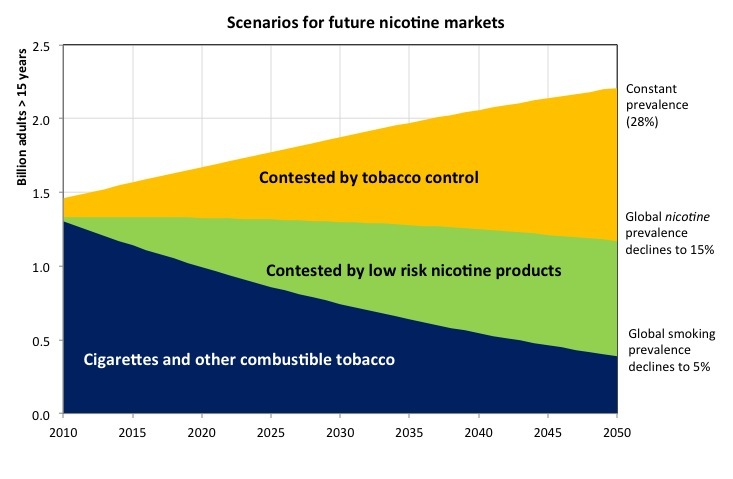 Also agree that there’s a greater chance market / circumstances render them irrelevant than FCTC agreeing on its own to change them. In the meantime, correcting obvious errors / falsehoods presented as facts is at least a start . . .
People go on and on about the health issues, or their right to determine their own purchasing choices, or whatever – but all these things are essentially irrelevant. You’re going up against the smoking economy, and it owns everything in health. You are fighting a machine worth more than a trillion dollars a year and it can and will protect itself against you. Every voice you hear speaking against ecigs is owned or instructed or influenced by the smoking economy. You are facing a trillion-dollar gravy train and the idea that it will let you take that money and power away from it is simply farcical. Well, it’s hard to reply to this kind of “grassy knoll” theory. But if you are correct, than big pharma should have long ago pulled the strings of legislators to permit cigarette advertising, keep taxes low, etc to keep up its gravy train of sick smokers. As much as I am cynical about big industry including pharma, the notion that pharma actually wants smoking illness is contrary to all my experience. They don’t need to do anything along those lines, it’s impossible to ban smoking as national and local government needs the money so much; and it’s virtually impossible to reduce it much below 20% of the adult population. No need to do anything except block serious threats to smoking. That’s why pharma funds all the front groups to block THR. Sorry but pharma makes between 10% and 20% of its gross from smoking, and it’s probably nearer the top end of that than the lower end. That’s ~$200 billion a year vulnerable to at least a 60% cut as ecigs gradually reduce smoking and disease. You can forget smoking cessation drugs, these are chump change in pharma’s portfolio (maybe $5bn a year or thereabouts). Sick smoker treatment drugs, and the massive boost to general drug sales, is where it’s at. Chemotherapy drugs, COPD drugs etc. ; the fact that smokers are >40% likely to be diabetic etc etc; the huge boost to cholesterol, blood pressure, and diabetes drugs. That’s hundreds of billions a year and that’s what they must protect. And protect it they do, at any cost. Pharma owns health. All health policy is specifically targeted at protecting and promoting the pharmaceutical industry. Their most valuable asset of all is the unspoken principle that they alone decide any/all legislative issues related to health and health economics. And of course their great skill with legislative matters, and legislators, allows them to win any battle. Take the recent EU defeat of ecig medicalisation for example. This was a red herring pure and simple, and an easy ploy to fob off on the naive ecig lobby who are just children in this game compared to pharma. Do you really think that people who can afford to spend tens of millions on lobbying, and spend tens of millions on hiring the best advisors, and spend tens of millions on bribes, would somehow think that medicalisation of ecigs would fly? Of course not – such an idea is ridiculous. What they did was put up a medicalisation plan that would either fail at the EU or fail later in supreme courts, while all the time putting the real effort into tobacco classification of ecigs, knowing this can be used to get an almost total ban and in addition get the real result needed: a ban on web sales. Only useless ecigs sold by tobacco companies on the high street will be left, and they can be taxed to the rafters and rendered useless and undesirable as a result. It pains me but I do believe that you’re 100% correct. The current incestuous status quo between tobacco causing harm and profiting, Govts taxing Tobacco and profiting and Pharma treating the resultant harm and profiting is at stake and effective e-cigs are the loose canon that threatens to jeopardise this cosy circular relationship. It is not a big surprise that Big Pharma owned WHO attacks against e-cigs. The Big Pharma needs smokers not only to sell useless NRT products but to get smoking related deceases so that they can sell expensive drugs to cure those deceases including COPD and cancer. These bans have nothing to do with public health. As I have said before, NRT is not a priority for any pharma company — it’s a modest sized consumer market. The idea that pharma is deploying legions of lobbyists here is only marginally accurate. Pharma makes money in ethical drugs — prescription drugs while looking large in the mind — is generally small business for pharma. Tobacco control is your challenge here. I think the underlying tobacco control mentality is this: we are winning the war on cigarettes. because we are winning, let’s not change the game. I think that’s right… but we still hear ‘one billion deaths’ bandied around. It’s a strange kind of victory that ends in a billion dead. The tobacco control industry ceased winning anything in 2008. Once the 20% Prevalence Rule operates then they have no influence and no function. In the UK, smoking stayed at the same prevalence for the 5 years between 2008 and 2013, and has only begun to fall recently due to the ecig effect (2 million UK vapers now). On the other hand, they win and continue to win the fraudulent funding war, and are massive victors there – indeed, the TCI are the ultimate spongers: as parasitic rent-seekers they have no equal, gaining enormous funding for zero result. They won’t be telling you any time soon that the number of smokers in the UK rose by 0.5 million between 2008 and 2013, for example. The utterings of the WHO on the use of e-cigs seem somewhat akin to an intention to ban seat belts in vehicles on the grounds that someone could use a seat belt to commit suicide! If a vaper wants to take the ‘risk’ of inhaling nicotine in a way that cannot possibly harm any other person, then that is solely his or her business. If the ‘normalisation of smoking’ is WHO’s concern, let them try and convince us that a child could not recognise the difference between, say, a bottle of pop and a bottle of bleach, a railway line and a footpath, a puddle and a well, a pushchair and a rubbish skip. How stupid do they REALLY think people are? This makes for a really good read. When the health experts told me I was killing myself by smoking, I listened but I chose to make my own decisions, because I am free to do so. When the experts told me I was killing others, I listened and I questioned the data, because I am free to do so. When I was banned from smoking in public places, I obeyed the law because that is my duty. I quit smoking because I felt it was right (for me) to do so. I took medications to help me; they didn’t! I took up a much safer alternative, which did. I now vape, because I am free to do so. If someone tells me I can’t, then I shall ask them to justify their reasoning. If they fail to convince me, I shall continue to make my own decisions, because I am free to do so. If they try to stop me by legislation based on illogical and ideological fantasy, I shall fight back, for that is my right, nay, my duty! Again, this is the sort of Libertarian thinking that also cuts against virtually all drug regulation — period. My body, my chemicals, my business. I am actually pretty sympathetic to it. Nicotine does not have to be produced from tobacco (cured leaves}. It can easily be produced from green tobacco plant leaves. Green tobacco plant leaves are not tobacco. As far as I know, and I have read up on the literature, the tobacco plant which contains the highest amount of nicotine is ‘nicotiana rustica’ which not generally used to produce smoking tobacco, although it is so used in some parts of the world. What is the point of going through the process of curing the leaves (which is simply to turn the starches into sugars) when you can extract the nicotine without doing so? Nicotine extracted from green leaves is no more a tobacco product than would be nicotine extracted from tomatoes. The WHO is acting in a tyrannical fashion, as becomes a monopolistic organisation. But only our elected representatives can do anything about it, and they are fast asleep. I wonder what would happen if UKIP broadened its attack on corruption in the EU to include corruption in the UN? mon cher professeur, I am a chemist. Period. Please don´t call intelligent people silly because you have not learned enough chemistry. Yeah, no one is using synthetic nicotine because nicotine can be easily extracted from tobacco. And there are a dozen ways to synthesize -nicotine!!! 100% active! And if the WHO says that synthetic nicotine is NOT!!! a tobacco product we must be silly not to use synthetic nicotine! I think the silly thing is not the idea of using synthetic nicotine, but a legal / regulatory regime that would differentiate between products based on where the nicotine comes from. It would be silly to make it attractive to use expensive and difficult to make synthetic nicotine just to get around bad regulation. It doesn’t matter what the hardware is called (an ‘e-cigarette’ for example) and it doesn’t matter where the nicotine comes from (tobacco, Duboisia, synthetic or wherever). Their mission is to prevent THR in order to protect pharmaceutical industry income (by protecting smoking). All they need to do is change a few words in the laws – nothing could be simpler. Currently we make it easy for them; but making it a little more difficult is not going to stop people who need to protect a $200 billion income channel. The sums involved are so vast that essentially they have unlimited funding for this purpose, and any laws required can be created without problem. Bribes of €10m come out of petty cash. Please stop trying to find simplistic answers to this problem. There is only one problem to be fixed, and until it is fixed you really can’t do much: major industries own the law. Pharma owns any/every law relating to health – and until you can fix that issue then there is no point scurrying around trying to put sticking plasters on gaping wounds. 1. as a chemical substance, synthetic nicotine contain both isomers of nicotine -nicotine and +nicotine. Only -nicotine, the one produced by tobacco, is active. +nicotine is inactive. So, half of it would be inactive. 2. it would be much more expensive to produce synthetic nicotine, than to extract it from tobacco. My proposal is still to use synthetic nicotine. There are many routes to nicotine. And price will fall with volume. I would buy shares of the first company producing synthetic nicotine. And vapers should spend some money for the elaboration of the cheapest route to synthetic nicotine. A list of the world’s most murderously corrupt organisations includes the WHO, EU, FDA, CDC and MHRA. It remains to be seen which will have the most influence and thus cause the most deaths (by deliberately outlawing the prevention of those deaths), but it looks as if the WHO is in the running. They will need to go some in order to overtake the EU with its current figure of somewhere between 70,000 (my guess) and 580,000 (Rodu putative calc. ), and its gearing-up to take this to a solid 400,000 a year with the Snus ban and the ecig partial/total ban; but the WHO does have a global influence so it could yet manage it. This part of the WHO is a wholly-owned property of the pharmaceutical industry, and a lot more publicity needs to be given to this. They will do anything to preserve the smoking gravy train for another few decades. Smokers have accepted, almost without a whimper, the draconian restrictions on smoking in public places, probably not aware – as I was not – that the science on second-hand smoke was unclear at that time (and since then there has been at least one long-term study showing that the dangers of second-hand smoke were hugely over-stated). We have been convinced that smoke is harmful to other people’s health, and we don’t want to be responsible for such harm. But who cares about harm to us smokers??? Clive – you seem to, and there are a few other lonely voices raised in protest against what is happening in the name of “public health”. Snus were banned across Europe without any proper justification – and people just accepted that without going out on the streets and rioting, or challenging it in the courts. Are vapers also going to accept similar moves to ban the use of the e-cigarettes, without taking strong action before it is too late? I hope not. But how can we stand together against such powerful organisations? We have seen that the politicians won’t listen to us, even when we email them in our thousands; they won’t even listen to scientists who have actually carried out independent studies on e-cigs. The media seem to just publish opinions of public health “experts” without checking the facts or publishing the other side of the story. It feels as though everything is stacked against e-cigarettes and vapers. I wish I knew how to change that, but I feel very helpless. I am so discouraged by the WHO’s unreasonable stance. I think they are just more of the same public health rubbish. Its all about power and control. It has become very corrupt and there is less and less concern for individual freedom to choose. The WHO has also announced a campaign against fat and sugar. More of the same. Public Health, as a body, and especially the WHO, has lost my respect. They no longer deserve to be listened to. About anything. Which, by the way, is in need of a publication venue in its english version. If there are some with good press relations, we have the material ready in English and German. Your report clearly demonstrates the massive Pharma offensive via WHO to attempt to control the use of “safe” nicotine and to ensure the harm from tobacco cigarettes is not eradicated via safer methods of obtaining and using recreational nicotine. The motives of WHO is deeply worrying and it beggars belief that a product universally scientifically proven to be 99% safer than smoking tobacco is even being considered to be on par with tobacco smoking and needing such draconian and frankly immoral legislation/guidelines. These are also intelligent people, but seemingly without any semblance of moral fortitude.